When you understand your customers well — like their age, location, and interests — you can make more informed decisions about your marketing programs. 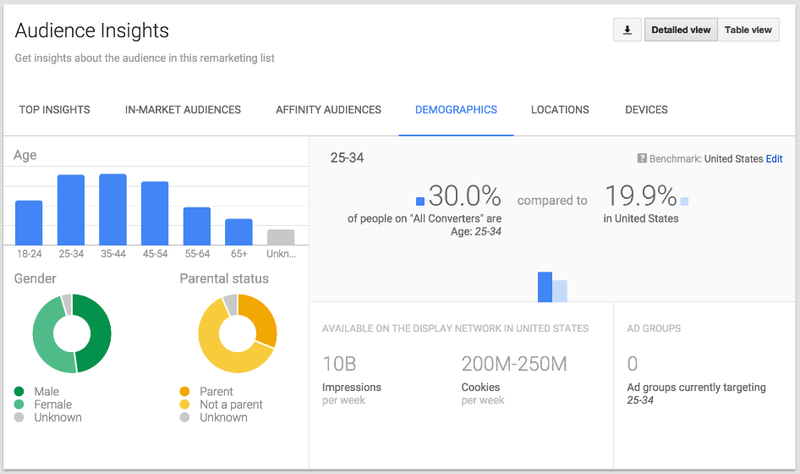 AdWords audience insights give advertisers aggregate information about people on your remarketing lists, including demographics, interests, locations, and device usage.1 Since these reports are available right in AdWords, you can quickly and easily take action on the insights. For example, if most people who converted on your site are jazz enthusiasts, you may wish to add this affinity audience to your campaign. Or, if many of your customers are females between the ages of 25 and 34, you might want to customize your ad creative to appeal to this demographic. Learn more. compared to an average of 19.9% in the US. BASE, a Belgian telecommunications company, used AdWords audience insights and discovered cycling enthusiasts were twice as likely as the average customer to buy a mobile phone subscription. Based on this insight, BASE engaged with cycling enthusiasts on the GDN and doubled its conversions. BASE now uses AdWords audience insights to inform its campaigns, online and offline. Sony PlayStation discovered classical music enthusiasts were likely to engage with its brand using AdWords audience insights. Sony then connected with this audience on the GDN and drove a 31% higher view-through rate than with its average affinity audience. This allowed Sony to capture more views for its budget. Now, Sony uses AdWords audience insights to uncover the best audiences for its new campaigns. Most display ads — 56% in fact — never had a chance to be viewed because they were below the fold, scrolled out of view, or in a background tab. Soon, we’ll make the GDN one of the only media platforms where advertisers don’t pay for an ad impression unless it was viewable. This means your media dollars will only be spent where they can have impact. In the next few months, all campaigns that buy on a CPM basis will be upgraded to be viewable CPM (vCPM). People use devices of varying shapes and sizes, engaging with content that can be horizontal, vertical, tapped, swiped or pinched. This means ads must be flexible so they can show across varying placements. Today, we introduced enhancements to dynamic remarketing so ads can be automatically re-shaped and re-sized to fit all device types. Ads are also touched up to look great on any mobile or desktop site, or app. For example, if your logo is predominantly blue and yellow, AdWords may use these colors to shade the border and background of your ad. We’ll even try out varying color combinations and use the ones that drive the best performance. As always, you have control to make changes to these selections based on your personal style and preferences. Meeting consumer expectations requires technology to answer their needs the moment they have them, wherever they are, whatever kind of device or screen they are using. Programmatic advertising ensures that brands are there in those important moments when decisions are made and preferences are shaped. Our hope is that the GDN brings this enterprise-level technology to all advertisers so you can be there at the moments when it matters most for your brand. 1 All insights are based on anonymized, aggregated data. Consumers have higher expectations than ever because of mobile — they want everything right, and they want everything right away. To connect with consumers in the intent-rich moments when they want to buy, find or do something, marketers are increasingly turning to programmatic advertising — which uses data and technology to reach the right person at the right time. The Google Display Network (GDN) brings this sophisticated technology to all advertisers so you can be there in the moments that matter the most for your brand. Today we’re introducing several tools that further enhance what the GDN offers for display advertisers. Over the course of the year, we’ve been working hard to make videos more interactive, shortening the distance between the time a viewer sees an ad and their actual purchase. First we launched Cards, which let you share product information directly within your videos across all screens. We took this feature further with TrueView for shopping, which is a bit like “automatic” Cards – simply connect your Google Merchant Center feed to your TrueView campaign to dynamically insert product cards within your in-stream ads, based on the products that are most likely to lead to a conversion. To help advertisers reach all the other product-focused content on YouTube – from unboxings, hauls, product reviews and how-to videos – today we’re announcing Shopping ads for YouTube. These will let you show a click-to-buy ad within partner videos on YouTube, going beyond your own videos to transform any relevant video into your digital storefront. Similar to Shopping ads on Google, you only pay when a user clicks on your ad. We’ve kept the format similar to Cards and TrueView for shopping, so users can easily recognize and click on the “i” icon at the top right of a video to view the Shopping ads. 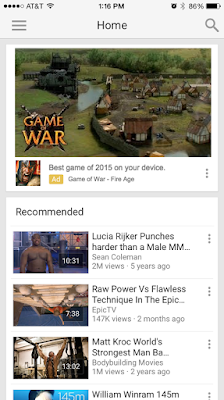 Shopping ads on YouTube are built off of your existing product feed in Merchant Center. They will enter an auction similar to Shopping ads on Google search and are selected based on a variety of contextual signals. Shopping ads on YouTube provide an entirely new revenue stream for creators, providing another way to monetize product-focused videos. They also provide a more interactive experience for viewers, letting them shop directly from videos. Stay tuned as we roll this new capability in the coming months. Mobile viewership on YouTube continues to grow. In fact, the average viewing session on mobile is now more than 40 minutes, up more than 50% year over year. We’re focused on creating ad formats that help you reach viewers across all screens, and today we’re making YouTube an even better place to promote your mobile apps. Building off the success advertisers are seeing with app promotion in in-stream ads on YouTube, we’re introducing TrueView for app promotion for our in-display format as well. This format reaches potential users when they’re exploring content on YouTube. Early results from brands promoting their apps with in-display point to strong performance both in cost per install and lifetime value. 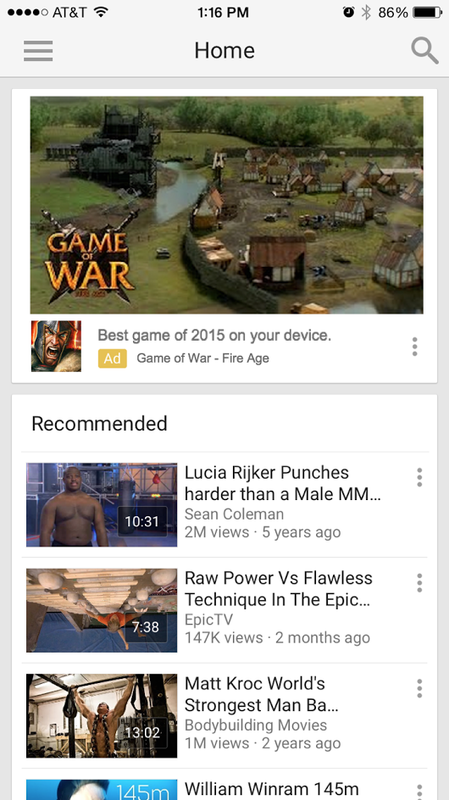 We’re also enabling app promotion ads in our dedicated Gaming app, because what better place to promote gaming apps than in YouTube gaming content? And in the coming months, we’ll bring the ability to bid by cost per install. You tell us what you want to pay for a download, and we’ll optimize for that price. In an early beta, Smule used target CPA bidding to increase installs by 85%. We’re also focused on providing better measurement, helping you understand whether your investments are driving results. Our Brand Lift solution, for example, helps you measure interest by monitoring lift in organic keyword searches related to your brand on Google.com. Starting today, Brand Lift will look not only at searches on Google.com, but will take YouTube searches into account as well. With this update, you’ll be able to see if your ad is driving searches for organic video content related to your brand on YouTube. Measuring interest is an important part of determining impact, and is a unique benefit of advertising on Google and YouTube. Finally, I’d like to call out our new targeting product, called Customer Match. Announced yesterday, Customer Match helps you reach your existing customer base with the right message across three of Google’s largest properties: Google Search, YouTube, and Gmail. Advertisers looking to grow their brand can also use Similar Audiences with Customer Match to reach prospective customers across YouTube and Gmail based on the interests and characteristics of their existing customer base. With Similar Audiences, you can leverage your customer email lists to discover new audiences that are most like the customers you already have. These new targeting features enable advertisers to connect with – or exclude – customers to drive the best results for their brand. As we head into our second decade as the place the world comes to engage with video, I’m excited to see us continuing to move fast, to build new things and to help marketers build brands. We can’t wait to see what you’ll do with these new tools. Over the past 10 years of YouTube, video viewership has come a long way. In fact, according to new commissioned custom research conducted by Nielsen, the time 18-49 year olds spend on YouTube grew by 44 percent, while the time they spend watching traditional TV fell by nearly 10 percent over that same time period. YouTube has become the place the world comes to watch, share and engage with video. And we want to keep creating even better experiences for the viewers, advertisers and creators who turn to YouTube every day. So today at IAB Mixx, we announced new products that point toward the future of our video ad platform, specifically around interactivity, mobile, and measurement. , I’ll be announcing two new products, Customer Match and Universal App Campaigns, to help you be there and be relevant in those intent-rich moments that truly matter. 70% of online consumers agree that the quality, timing, and relevance of a brand’s message influences their perception of a brand.1 Google is in a unique position to connect consumers with your business in the most relevant ways. Whether they’re searching on Google, checking promotions on Gmail, or watching videos on YouTube, we can deliver the most relevant information based on what they’re doing, wherever they are, when they’re looking, and on any device they’re using. Today, we’re building on these capabilities with new ads innovations to deliver even more relevance. When it comes to your most valuable customers, they expect even more from you. And now, Google can help you reach customers that you already have a relationship with -- like those in your loyalty program or who have made a previous purchase -- in ways that are most relevant to their intent and context. Customer Match is a new product designed to help you reach your highest-value customers on Google Search, YouTube, and Gmail -- when it matters most. Customer Match allows you to upload a list of email addresses, which can be matched to signed-in users on Google in a secure and privacy-safe way. From there, you can build campaigns and ads specifically designed to reach your audience. Users can control the ads they see, including Customer Match ads, by opting out of personalized ads or by muting or blocking ads from individual advertisers through Google Ads Settings. Let's say you’re a travel brand. You can now reach people who have joined your rewards program as they plan their next trip. For example, when these rewards members search for “non-stop flights to new york” on Google.com, you can show relevant ads at the top of their search results on any device right when they’re looking to fly to New York. And when those members are watching their favorite videos on YouTube or catching up on Gmail, you can show ads that inspire them to plan their next trip. With Customer Match, your brand is right there, with the right message, at the moment your customer is most receptive. Only Google can help you do this to delight your most loyal customers in the moments that truly matter. Customer Match and Similar Audiences will be rolling out to all advertisers over the next few weeks. Learn More. People discover new apps in many ways: online searches, recommendations while watching their favorite videos, and in-app suggestions. If your business has an app, you need a scalable way to reach the customers that are most likely to install your app -- across a variety of channels. 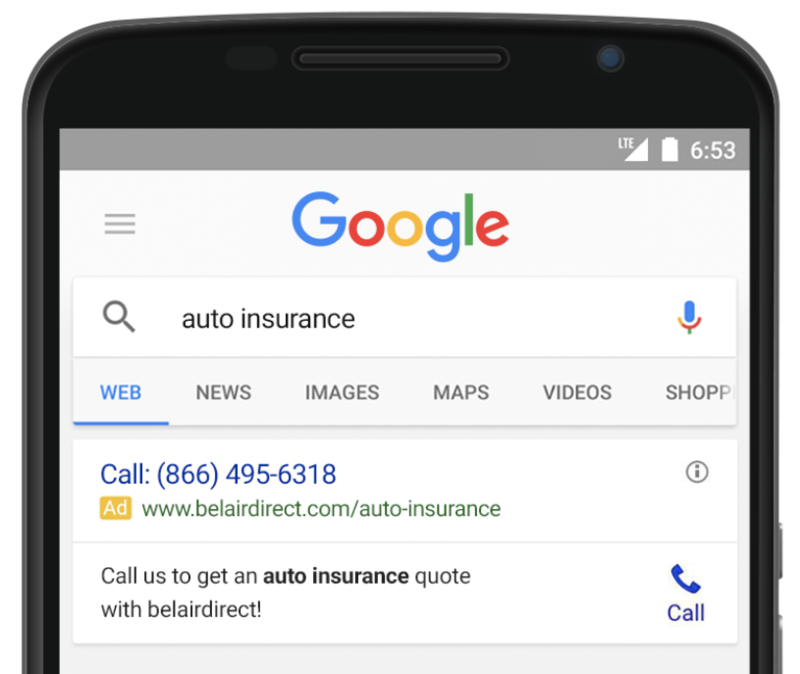 Starting today, Universal App Campaigns will be available to all developers and advertisers as a new AdWords campaign type that helps you connect with app users across Google Search, Google Play, YouTube, and the Google Display Network (GDN). In just a few simple steps, you can promote your app with unparalleled reach across the world’s largest network and platforms. Let’s say you’ve built an adventure game. With Universal App Campaigns, you have unparalleled reach: you can drive installs on YouTube, the platform with 1B+ users who watch hundreds of millions of hours of content everyday. Your ads can also reach specific audiences across 650K apps and 2M+ websites in the GDN. And importantly, Universal App Campaigns tap into intent-rich searches like “adventure games” and “puzzle games” that are happening throughout the day on Google Search and Google Play so your app can be seen when people are looking to download something new. All you need to do is give us your desired cost-per-install and we do the rest. Universal App Campaigns are the one-stop-shop campaign type that scales your reach and maximizes Android app installs across Google’s entire suite of ad platforms. We’ve automated campaign set-up by pulling in your app images, videos, and app description directly from your Google Play store listing to generate ad formats that look amazing wherever they’re placed. From there, our systems will optimize your campaigns using dynamic learning to maximize app install volume at your target cost-per-install. 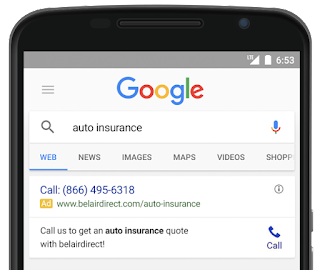 By testing different versions of your ad text and app images in each of the eligible Google networks, we determine the highest-performing variations so only your best ads show. Learn more. The energy and buzz at Advertising Week 2015 (Join the conversation) reinforces what an exciting time it is to be a marketer. I’m privileged to get to build products that help brands tell their stories and connect with consumers in the moments that really matter to them. 1 Google/Ipsos, "Consumers in the Micro-Moment," March 2015. Mobile has changed the game for both consumers and brands. Consumer expectations for immediacy and relevance are higher than ever, and successful brands are those that connect with people in the moments that matter most to them -- the I-want-to-know, I-want-to-go, I-want-to-do, and I-want-to-buy moments. Google is a company built on meeting people’s needs in the moment. Through our ads innovations, we’ve brought that ability to businesses large and small. On Monday afternoon at Advertising Week’s Times Center Stage, I’ll be announcing two new products, Customer Match and Universal App Campaigns, to help you be there and be relevant in those intent-rich moments that truly matter. 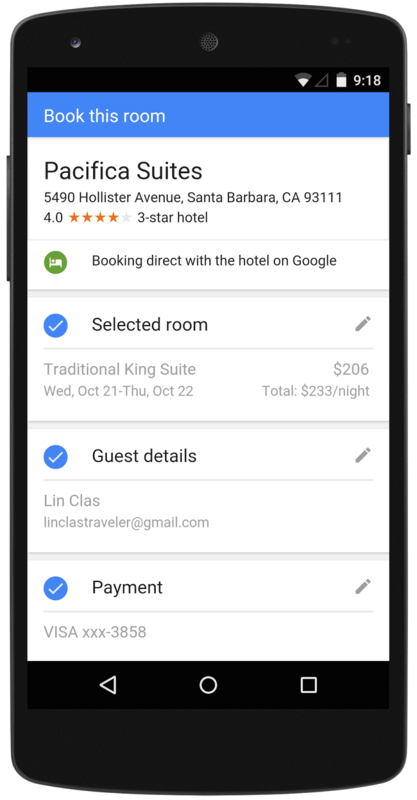 across Google, to help travelers find information more quickly and to enable hotels to generate more qualified leads. As a continuation of these efforts, we’re announcing a few more changes to Hotel Ads on Google: broader availability for the Google Hotel Ads Commission program, an expansion of the Book on Google feature to more partners, and the inclusion of more amenity information within Google search. With these changes, we’ll be retiring the dedicated site for Hotel Finder this week, as users are now able to access the hotel information they need right from Google search. Earlier this year we started testing the Google Hotel Ads Commission Program with a small set of independent hotels. With this program, these hotels are charged on the industry-standard commission basis rather than cost-per-click, making it easier for smaller, independent hotels to use Google Hotel Ads. Today, we’re announcing that more hotels can participate in this program now that we’ve partnered with leading hotel technology solutions providers. We currently work with DerbySoft, Fastbooking, Sabre Hospitality Solutions, Seekda, TravelClick, and Trust International and will be integrating additional hospitality technology providers in the future. In 2013, we launched Book on Google on mobile devices to make it easier for users to book hotel rooms directly from their phone. Now, we’re expanding the availability of Book on Google, bringing it to desktop and tablet devices and making it easier for more hotels to participate. 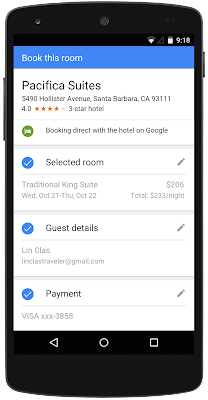 With Book on Google, Google facilitates the booking payment transaction. The hotel partner owns the guest relationship, including sending the confirmation email, answering post-booking questions, and handling changes to the reservation or cancellations. “Given the successes that our hotel clients have experienced with Google Hotel Ads, we look forward to offering additional Hotel Ads features to our hotel clients globally, including Book on Google,” said Scott Koehler, Senior Vice President, Product & Operations of TravelClick. Book on Google is available to all Hotel Ads partners and works for users in the U.S. Earlier this year we announced improvements to hotel search across Google so users can find information like availability, prices, and reviews right in the search results and in Google Maps. This month, we’re adding information about hotel amenities for locations in the U.S. and we’re working to add this information for 24 more countries through next year. This means that users will now see whether a hotel has things like free WiFi, free breakfast, parking availability, a pool, or a business center, right in search. We’re focused on helping travelers find information and choices about hotels, while making it easier for them to select and book the hotel that’s right for them. We’re also committed to helping partners connect with travelers when they are ready to book, across devices and Google platforms. We hope the changes announced today will make planning that next trip an even easier click away. Over the past several months we’ve made improvements to hotel search across Google, to help travelers find information more quickly and to enable hotels to generate more qualified leads. As a continuation of these efforts, we’re announcing a few more changes to Hotel Ads on Google: broader availability for the Google Hotel Ads Commission program, an expansion of the Book on Google feature to more partners, and the inclusion of more amenity information within Google search. With these changes, we’ll be retiring the dedicated site for Hotel Finder this week, as users are now able to access the hotel information they need right from Google search. that help multi-channel advertisers more easily manage reporting for specific campaign types. For example, if you want to see performance columns for Display, you can quickly filter your view to see only your Display campaigns. Today, we introduced another important enhancement to AdWords - TrueView is joining Search, Shopping and Display campaigns within the core AdWords interface. Now we are adding three new reporting columns to make it easier to report across all of these campaign types. As we add more campaign types into AdWords, we want to help you surface key insights across all of the campaigns you manage. That’s why we’re rolling out three new reporting columns to help you quickly report on some of the most important ad interactions that occur across all of your campaign types. Interactions - An interaction is the main action people take with your ad format— such as clicks for text and shopping ads, views for video ads, and engagements for Lightbox ads. Interaction Rate - Interaction rate is used to measure how often people interact with your ad after it’s shown to them—for example, clicks divided by impressions for text ads, or views divided by impressions for video ads. Avg Cost - Average cost is the average amount you've paid for your ads divided by total interactions—clicks divided by cost, or views divided by total cost. When viewing multiple campaign types, these columns give you a more uniform and quick way to view key metrics for your campaign types in a single column. For example, for search, the primary metric you might want to view is clicks. And for video, your primary metric is views. Now, you can use the Interactions column to quickly see a combined metric for clicks and views for each of these campaign types within a single column. Additionally, to make reporting by specific campaign type easier, you’ll now see your Total rows broken out by campaign type, instead of by network. And you will also see total rows for only the campaign types you manage. Over time, you may start seeing these columns in other areas of AdWords. To learn how to start using the new ad interactions columns in your AdWords reporting, check out our Help Center. In April, we introduced improvements that help multi-channel advertisers more easily manage reporting for specific campaign types. For example, if you want to see performance columns for Display, you can quickly filter your view to see only your Display campaigns. Today, we introduced another important enhancement to AdWords - TrueView is joining Search, Shopping and Display campaigns within the core AdWords interface. Now we are adding three new reporting columns to make it easier to report across all of these campaign types. 1. Starting today, these native Gmail ads are now available for all advertisers directly in AdWords. As we’ve developed Gmail ads, we’ve tested various formats to see what users find most engaging. One improvement we’ve made is to remove standard text ads from Gmail and show fewer, higher-quality native ads that integrate more seamlessly with the inbox experience. 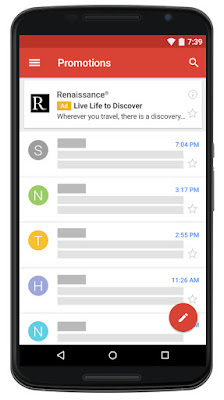 The collapsed ad that users initially see that matches the look and feel of the Gmail inbox. Users can click on this to expand it and get more details. The expanded ad unit is triggered by a click on the collapsed ad. This is a full-page native ad that recreates the informational and visual richness of a landing page. After users click to expand, any subsequent clicks on your content are free, including clicks to save the ad to your inbox or forward it to others. Advertisers can choose from several customizable Gmail ads templates for the expanded ad unit. They can feature a single image, highlight a promotion that combines an image with a description and call-to-action button, or showcase multiple products at once. The custom HTML format offers the greatest amount of flexibility in how you configure your assets and allows you to create an even richer ad experience by including videos, forms, phone numbers, and multiple links and calls-to-action. You can use most of the display targeting options you’re already familiar with like keywords, affinity audiences, demographics, and topics. For example, a sports apparel advertiser could select relevant topics like “Fitness” and “Sporting Goods” or reach people in the “Health & Fitness Buffs” or “Running Enthusiasts” affinity audiences. 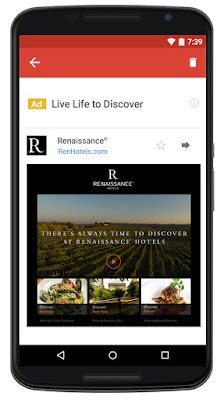 “We've had a lot of success working with our media agency, Beeby Clark+Meyler, to run Gmail ads and drive awareness for Renaissance Hotels. The larger ad unit allows us to feature videos and imagery that highlight the experience at Renaissance Hotels and our commitment to helping guests discover something new at their destination. We partnered with our creative agency, Anomaly, to embed rich visuals into our ads, and were able to drive great user engagement with 25% longer time spent on site and an 18% increase in pageviews per visit on RenHotels.com. This unit has also delivered ongoing high reach for the Renaissance Hotels brand. Since then, we've rolled out Gmail ads to additional Marriott International brand hotels globally and we're excited to launch them soon for our Autograph Collection Hotels as well." As Gmail ads have evolved, we've continued to give users the ability to actively control the types of ads they see. As with other Google ads, users can manage their ad settings to remove unwanted ads from specific advertisers. They can also opt out of interest-based ads entirely. To learn how to set up your first Gmail ad, visit our Help Center for more information. Email is a big part of our everyday routines as a go-to place for staying in touch with family, friends and colleagues. It’s also a great way to get the latest updates from our favorite brands, whether we’re hearing about a huge weekend sale, getting deals on vacation packages, or learning about a new cutting-edge product. For several years, we’ve been working with advertisers to extend their email marketing strategies and test ways to bring more relevant offers to users with native Gmail ads1. Starting today, these native Gmail ads are now available for all advertisers directly in AdWords.